Greece Helicopter charter services. 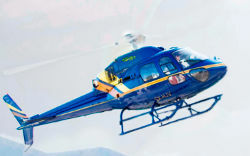 Helicopter rentals in Athens, Mykonos, Santorini. The helicopter today, constitutes the most rapidly developing means of transportation in the world. It has an ability to carry passengers and cargo, even to the hardest-to-reach places, at a fraction of the time required for the other means of transportation. This makes it the most attractive solution for every kind of transportation need. Not only for business. • Chartering a helicopter or an aircraft is an option that you should check every time you travel, either for business or pleasure. We can provide for you different types of helicopters depend in your needs and the flight services you may wish. Specialized personnel, excellent organizational structure, competitive prices, and above all, continuous care for total customer satisfaction is a good reason to ask our advice. Our company also offers helicopter sightseeing tours all around Greece mainland and the islands, showing you the best highlights of it. Whether you want to fly around the country, explore out of the way places or even have an adventure like no other we can help you organize the perfect holiday. This is one of the largest single engined turbine helicopters. It is spacious and comfortable and can be configured to meet most flight demands from sightseeing to VIP transport. A powerful twin turbine VIP helicopter with a superior comfort and a quiet, air-conditioned leather seating cabin. It is ideal for long distance rides or large passenger loads. It is one of the fastest twin engine and one of the most popular helicopters among VIPs, which offers very height levels of flight comfort, speed and payload.